540 N. San Vicente Blvd. Alessi at DIVA (311 N. Robertson Blvd) Alessi has long been at the forefront of innovative and inspired product design, creating a dynasty out of offering products targeting the mainstream while creating some of the most iconic objects of our time. At Ann Sacks, their passion is helping you make your home an expressive, exceptional space. They've built our reputation with innovative and beautiful tile, stone and plumbing that can bring your unique vision to life. Whether your setting is traditional or modern, Ann Sacks offers an infinite variety of inspiring designs at a wide range of price points. Although rugs have been the family business for generations, the Ahmadi family’s biggest achievement so far is in Ariana Rugs Inc., founded in 1990 and operated by a brother and sister trio: Alishah (Alex), Ahmad and Nadia. They have worked hard to build Ariana Rugs Inc. into an empowering company best known for our innovative techniques, having a child-labor free environment, and establishing a foundation in which women feel safe to work and become independent. Artemide is one of the world’s most prestigious contemporary lighting manufacturers. Its "Human Light" philosophy places men and pursuit of their well-being at the core of research. It is a synonym for Design, Innovation and Made in Italy. 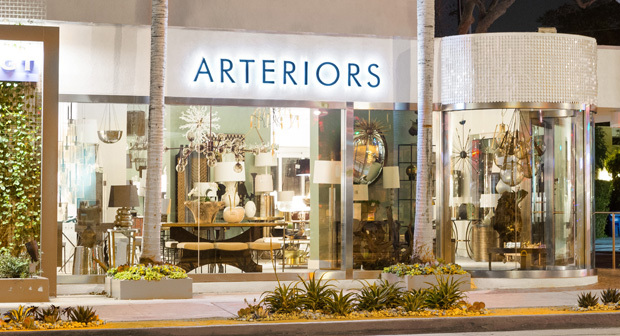 Founded by Mark Moussa in 1987, Arteriors is a Dallas-based company specializing in lighting, furniture, and decorative accessories. The company collaborates with experienced artisans and manufacturers around the world producing a full spectrum of styles in luxury materials and finishes. Diva Group was established in 1985 and since its conception has become the prominent destination for modern European furniture, lighting and accessories in Southern California. Diva Group houses its collections in four separate showrooms. Between the Sheets is known for the finest in 100% Giza Egyptian cotton bedding from Italy, Siberian down comforters, extensive selection of beautiful bath accessories, unique home furnishings, lighting and so much more. Custom Comfort Mattress is a family owned Southern California company. They manufacture the highest quality double-sided mattresses in both standard and custom sizes. In the end, it’s all about comfort and they know how to customize it to your needs. David Phoenix has earned his reputation as one of the country’s most influential designers with 20 years of design experience, fifteen at the helm of his own firm. Creating designs that incorporate and reflect the personality and passions of his clients is David’s stock-in-trade. ddc is the leading source of contemporary furniture design. They offer an exceptional variety of home and contract furniture, lighting and accessories, ranging in style from classic modern to the most cutting edge designs in their showrooms. For over 50 years, Decorative Carpets has been a leading source for hand-tufted rugs and broadloom for the interior design market. Their products beautify floors around the world, from hotel lobbies and suites to the finest residential interiors. Dennis and Leen prides itself on individual care and detail. Some of our skilled craftsman that were employed by the original owners still work for the company today. The old master finishes and techniques are closely guarded secrets pass down. Design around Objects (DAO) is a contemporary furniture and lifestyle showroom with an emphasis on contemporary Italian furniture and organic collections. DOA offers complete furnishings for each room in your home along with unique accessories and artworks. Design Within Reach is your source for the best in modern design, from iconic mid-century works to innovative items designed today. They sell clean and simple furniture and accessories, representing designers, materials and processes that span categories and countries.